We are currently subject to the reporting requirements of the Securities Exchange Act of 1934, as amended (the “Exchange Act”). We file periodic reports, proxy materials and other information with the Securities and Exchange Commission (the “Commission”). In addition, we will furnish stockholders with annual reports containing audited financial statements certified by our independent accountants and interim reports containing unaudited financial information as may be necessary or desirable. We will provide without charge to each person who receives a copy of this report, upon written or oral request, a copy of any information that is incorporated by reference in this report (not including exhibits to the information that is incorporated by reference unless the exhibits are themselves specifically incorporated by reference). Such request should be directed to: Patrick Okorodudu, 1 Glenlake Parkway NE, 7th Floor, Atlanta, GA 30328. Our Web site is www.asherxino.com . We strive to provide free of charge on our Web site our annual report on Form 10-K, quarterly reports on Form 10-Q, current reports on Form 8-K, and amendments to those reports filed or furnished pursuant to Section 13(a) or 15(d) of the Exchange Act as soon as reasonably practicable. Members of the public may read and copy any materials we file with the Commission at the SEC's Public Reference Room at 100 F Street, NE., Washington, DC 20549, on official business days during the hours of 10 a.m. to 3 p.m. Members of the public may obtain information on the operation of the Public Reference Room by calling the Commission at 1–800–SEC–0330. The Web site of the Commission is www.sec.gov . That website contains reports, proxy and information statements and other information regarding issuers that file electronically with the Commission. Visitors to the Commission's Web site may access such information by searching the EDGAR database. This Form 10-K contains “forward looking statements” (as that term is defined in Section 27A(i)(1) of the Securities Act of 1933), including statements concerning plans, objectives, goals, strategies, expectations, future events or performance and underlying assumptions and other statements which are other than statements of historical facts. Such forward looking statements involve risks and uncertainties which could cause actual results or outcomes to differ materially from those expressed in the forward looking statements. Some of the factors that could cause actual results to differ materially from those expressed in such forward looking statements are set forth in the section entitled “Risk Factors” and elsewhere throughout this Form 10-K. Our expectations, beliefs and projections are expressed in good faith and are believed by us to have a reasonable basis, but there can be no assurance that our expectations, beliefs or projections will result or be achieved or accomplished. We have no obligation to update or revise forward looking statements to reflect the occurrence of future events or circumstances. AsherXino Corporation (“Asher”) was originally incorporated in the State of Colorado on June 9, 1981 under the name “Blue Grass Breeders, Inc.” In the subsequent twenty-two years, we became a public reporting company, changed our state of incorporation to the State of Delaware, went through various name changes and engaged in various businesses, as described in the section entitled “Prior history” below. We have had no operating business since 2003. In 2003 we ceased filing our periodic reports with the Securities and Exchange Commission (“SEC”) due to the fact that we had no operations, and our securities were subsequently deregistered by the SEC on April 30, 2009. In June of 2009, our Board of Directors decided to enter into the business of owning and operating oil and gas assets by acquiring certain oil related assets (“Asher Assets”) from certain individuals (“Asher Shareholders”). The Asher Shareholders acquired beneficial ownership of the Asher Assets acting through ASHER Energy Corporation as their agent, and they became shareholders in Asher upon our acquisition of the Asher Assets. Because the Asher Shareholders seek the perceived advantages of being shareholders of a publicly held corporation, we re-registered our common stock by filing Form 10 pursuant to Section 12(g) of the Securities Exchange Act of 1934, as amended (the “Exchange Act”). We intend to comply with the periodic reporting requirements of the Exchange Act for so long as we are subject to those requirements. In connection with our acquisition of the Asher Assets, the Asher Shareholders have become directors and officers of Asher (see Item 5, “Directors and Executive Officers”) and will provide us with additional management and technical team members with diverse experience in the oil and gas industry. Through our acquisition of the Asher Assets, we are acquiring a 40% leasehold interest in and operatorship of an offshore oil exploration and development block in Nigeria, Oil Prospecting License (OPL) 2012, which has an indefinite lease term. See Item 2, “Properties”. In consideration for the asset acquisition, Asher has issued 105,000,000 shares1 of its common stock, or 87.5% of our total outstanding common stock, to the Asher Shareholders and a related party. The rights to OPL 2012 acquired by Asher are subject to our performing the following obligations: (i) a signature bonus of $12,500,000 payable immediately to the Nigerian government and (ii) a $10,000,000 farm-in fee payable to a local partner. We are in the final stages of securing funding to pay both the signature bonus and the farm-in fee. Through our wholly-owned subsidiary, ASHERXINO Nigeria Limited, a Nigerian registered company, we will operate and develop OPL 2012 under a joint venture arrangement with two Nigerian local partners, Grasso Nigeria Limited (which owns a 20% interest in OPL 2012) and Sigmund Oilfield Limited (which owns a 40% interest in OPL 2012), and the state-owned Nigerian National Petroleum Corporation (“NNPC”), which manages all oil block concessions in Nigeria to ensure compliance with government regulations. A percentage of the revenues generated from OPL 2012 will be paid to the Nigerian government as royalties. The prevailing royalty rate applicable to OPL 2012 is 12%, with a 50% discount for the first five years. As the technical and financial partner, we will be the sole company responsible for the development of OPL 2012. We will provide financial resources and technical services for the exploration, appraisal, development and production of hydrocarbons (including drilling and mining activities) within OPL 2012 and when OPL 2012 is converted to an Oil Mining License (OML). To date, part of OPL 2012 is in the exploitation phase; the remainder of the block is still under exploration and development. Once hydrocarbons are discovered, the first $10,000,000 of revenue generated from the sale of hydrocarbons produced from the property will be paid to Sigmund Oilfield Limited as a “Discovery Bonus”. We will fund 100% of the development costs of OPL 2012, including the signature bonus, farm-in fee, reserve audit report cost, seismic and engineering work and drill cost and production. We will recover our development costs from future revenue generated from OPL 2012 once the Discovery Bonus and government royalties are paid. Some of these development costs, such as the reserve audit report cost and the cost of a 2D seismic survey, have already been paid. We will be entitled to 60% of the revenue from OPL 2012 (after the Discovery Bonus and government royalties are paid) until we recover all of our development costs, together with a reasonable rate of interest. After we have recovered our development costs, our share of revenues (after government royalties are paid) shall be 40%. Our original estimated total development cost includes the cost of implementing a 3D seismic program of between $10,000,000 and $15,000,000; however, we now believe that based on existing vintage 2D seismic data on OPL 2012, there is a chance that we may not need to undertake a 3D seismic program. See Item 7, “Management’s Discussion and Analysis of Financial Condition and Results of Operations”. 1 For financial accounting purposes, these shares are deemed to have been issued for $53,750, representing the out-of-pocket expenses incurred by the Asher Shareholders in connection with securing the Asher Assets. In 2007, the Nigerian government carved out OPL 2012 from a larger oil block OML 137 operated by Addax Petroleum. Once the signature bonus of $12,500,000 is paid to the Nigerian government, we may be in a position to negotiate with the owner of the adjacent block, Eni Agip Nigeria Limited (“Eni/Agip”), to receive unitization revenue from Eni/Agip. Unitization refers to the joint, coordinated operation of a petroleum reservoir by all the owners of rights in the separate tracts overlying the reservoir. Such unitization revenue is subject to approval by the Nigerian government. 50% of any unitization revenue received from Eni/Agip will be payable to Sigmund Oilfield Limited, the co-owner of the OPL 2012 leasehold interest. See Item 2, “Properties”, for a more detailed description of the OPL 2012 asset. We intend to finance our operations through a combination of debt and equity financing. See Item 7, “Financial Information – Management’s Discussion and Analysis of Financial Condition and Results of Operations”. Our principal business objectives are to achieve long-term growth potential through its exploitation of the Asher Assets and to position ourselves as a leading independent oil exploration and production company: an “operator” of choice in the Gulf of Guinea, one of the world’s most prolific hydrocarbon regions. Nigeria is the largest oil producer in Africa and contains many small oil fields which have been considered “marginal” by the major multinational oil companies and thus have gone undeveloped. The market for independent oil producers in Nigeria has grown substantially in recent years. Not only is our management team experienced in identifying, negotiating and executing on attractive prospects and managing oil and gas projects, but we also possess a good understanding of the Nigerian petroleum system and Nigeria’s people, culture, business environment, community and environmental issues. We plan to use cutting edge technologies and experienced oil and gas professionals to exploit, develop and produce oil and gas while maintaining high ethical standards in all facets of our business, including minimizing any negative impact of its operations on local communities and embarking on community development programs in the areas where we operate. Our immediate objective is to create value from the production and exploration opportunities in OPL 2012. In the short term we intend to implement a drilling program for OPL 2012, which will entail the hiring of about fifty to one hundred full-time employees. Our longer term objective is to acquire and exploit prolific oil and gas deposits across the Gulf of Guinea by acquiring additional leaseholds in and operatorships of offshore blocks. Although we intend to build an asset base focused on the Gulf of Guinea (Nigeria, Ghana, Cote d’Ivoire), as an independent oil exploration and production company we will seek to acquire oil and gas assets anywhere in the world where management identifies lucrative prospects. Management intends to purchase a corporate insurance program standard for the our industry with specific coverage against property damage, sabotage and terrorism, general, product and environmental liability, loss of cargo, crime and Directors’ and Officers’ liability. We are subject to various risks that may materially harm our business, financial condition and results of operations. Prospective investors should carefully consider the risks and uncertainties described below and the other information in this Form 10-K before deciding to purchase our common stock. If any of these risks or uncertainties actually materialize, our business, financial condition or operating results could be materially harmed. In that case, the trading price of our common stock could decline significantly, and investors could lose all or part of their investment. The risk factors described below are not the only ones that we face. Additional risks and uncertainties that we are unaware of, or that we currently deem immaterial, may also become important factors that affect us. Nigeria has experienced internal security issues that have had and could have in the future a negative effect on Nigerian oil production and on us. Nigeria has experienced internal security issues, primarily due to the activities of Nigeria’s military and militant groups in the southern delta region, within the Gulf of Guinea. Nigeria’s main militant group, the Movement for the Emancipation of the Niger Delta, or MEND, has been conducting guerilla attacks on crude oil pipelines and other related infrastructure, kidnapping oil workers, and generally disrupting the activities of oil companies with operations in Nigeria for the last three years, reducing crude oil output by more than 20%. These activities and the violence associated with them have had and may have in the future a negative impact on Nigerian oil production, and could have a material adverse effect on our business and assets. Companies operating in Nigeria, including us, are subject to prevailing economic conditions and investment climate in Nigeria, which may be less stable than prevailing economic conditions in more developed countries. Because, at present, all of our operations are located in Nigeria, the market price of our securities may be affected by the prevailing economic conditions in Nigeria. In the past, economic growth in Nigeria has been negatively affected by political instability, corruption and lower foreign direct investment. The Nigerian government has exercised and continues to exercise substantial influence over many aspects of the Nigerian economy, and has changed monetary, fiscal, taxation, labor and other policies over time to influence the performance of the Nigerian economy. We have no control over the extent and timing of government intervention and policies. If the perception of improved overall security in Nigeria changes or if foreign direct investment declines, the Nigerian economy may face a downturn which could negatively affect our financial condition and results of operation. Our operations are subject to extensive regulation. The Nigerian oil and gas industry is subject to extensive regulation and supervision by the Nigerian government in matters including the award of exploration and production blocks, the imposition of specific drilling and exploration obligations, restrictions on production, price controls, capital expenditures and required divestments. The main supervisory and regulatory petroleum related agencies in Nigeria are the Nigerian Ministry of Petroleum Resources, Nigerian National Petroleum Corporation (“NPC”) and the Department of Petroleum Resources (“DPR”). All the petroleum in Nigeria is vested in the Nigerian federal government, which has absolute authority to control the resources and only permits their exploitation under license. The Nigerian government, through the Ministry of Petroleum Resources, allocates acreages or licenses to operators in any areas deemed to have potential for petroleum accumulation. The allocations are based on a set of criteria that is made known to potential bidders at the time blocks are open for bidding. The Nigerian government reserves the right to participate in the operations of any block and to determine the type of contractual arrangements between the licensee and the government. The terms and conditions of the agreements with the Nigerian Ministry of Petroleum Resources under which we explore and produce crude oil generally reflect negotiations with the Ministry of Petroleum Resources and other governmental authorities and may vary by fields and basins discovered. We are required, as are all oil companies undertaking exploratory and production activities in Nigeria, to pay a percentage of our production to the Nigerian government as royalties. Royalty rates are as provided in the Petroleum Act, CAP 350 Laws of the Federation of Nigeria 1990, and the prevailing royalty regime applicable to OPL 2012 is 12%. As a new company, we will benefit from a 50% discount for the first five years. In the future, the Nigerian government may amend royalty payment levels for our future acquisitions of oil assets and such changes could have a material adverse effect on our financial condition or results of operation. We are subject to extensive environmental regulations in Nigeria. Our operations are subject to extensive national, state and local environmental regulations in Nigeria. Environmental rules and regulations cover oil exploration and development activities as well as transportation, refining and production activities. These regulations establish, among others, quality standards for hydrocarbon products, air emissions, water discharges and waste disposal, environmental standards for abandoned crude oil wells, remedies for soil, water pollution and the general storage, handling, transportation and treatment of hydrocarbons in Nigeria. As a result of the creation of the Federal Ministry of Environment (“FME”) in 1999 and the enactment of more rigorous laws, such as the Environmental Guidelines and Standards for the Petroleum Industry in Nigeria (EGASPIN) 2002, environmental regulations will substantially impact our operations and business results. Under the Environmental Impact Assessment Act of 1992, all exploratory project drilling must have an environmental impact assessment approved by the FME and must receive an environmental permit from the local authorities. As the operator of an Oil Prospecting License (OPL), we are required to prevent the escape of petroleum into any water, well, spring, stream river, lake reservoir, estuary or harbor, and government inspectors may examine our premises to ensure that we comply with the regulations. The Department of Petroleum Resources also regulates environmental issues by requiring operators in the oil and gas industry to obtain permits for oil-related effluent discharges from point sources and oil-related project development. Non-compliance with environmental laws may result in fines, restrictions on operations or other sanctions. We are also subject to state and local environmental regulations issued by the regional environmental authorities, which oversee compliance with each state’s environmental laws and regulations by oil and gas companies. If we fail to comply with any of these national or local environmental regulations we could be subject to administrative and criminal penalties, including warnings, fines and facilities closure orders. Environmental compliance has become more stringent in Nigeria in recent years and as a result we will be required to allocate a significant percentage of our capital expenditures for compliance with these laws and regulations. These costs may have a negative impact on the profitability of the projects we intend to undertake or may make them economically unattractive, in turn having a negative impact on our results of operations and financial condition. We currently operate only in Nigeria. Because, for the foreseeable future, our oil revenues will be entirely based upon operations in Nigeria, the aforementioned risks unique to Nigeria may adversely affect us more than they would a company operating in several different countries. We are an exploration stage company. Following our acquisition of the Asher Assets, we are an exploration stage company. An exploration stage company is one in which substantial efforts are devoted to establishing a new business, but the planned principal business has not commenced, or, has commenced but has not generated significant revenues. As a result, we have a limited history upon which an evaluation of our prospects and future performance can be made. Our proposed operations are subject to all business risks associated with new enterprises. The likelihood of our success must be considered in light of the problems, expenses, difficulties, complications, and delays frequently encountered in connection with the expansion of a business, operation in a competitive industry, and the development of a customer base. We have not generated revenue since our acquisition of the Asher Assets and are unlikely to become profitable for some time. It is expected that we will sustain losses in the future. Management will face the challenge of raising capital as well as building a management team able to execute our plans. There can be no assurance that we will meet and overcome these challenges. We are dependent on financing. The timing of the various stages of our development plan is uncertain. Before we may begin our work program to develop OPL 2012, we must pay a $12,500,000 signature bonus to the Nigerian government and a $10,000,000 farm-in fee to our local Nigerian partner, and submit our work program for approval by the Nigerian government agencies responsible for oil exploration and production. See Item 2, “Financial Information – Management’s Discussion and Analysis of Financial Condition and Results of Operation”. Although we are in the process of concluding financing arrangements to raise sufficient funds to pay the signature bonus and farm-in fee, the exact timing of when we will be able to pay the signature bonus and farm-in fee is uncertain. Furthermore, although our management has had substantial experience working with oil and gas ventures in Nigeria and has previously dealt with the Nigerian government on other oil projects, it is impossible to predict the timing of government approvals of oil development work programs. Such timing is entirely within the control of the Nigerian government and will depend on a variety of factors, including the government regulatory policies then in effect, the government agency department supervisors involved in the approval process, and the workload and staffing of the government agencies. Our success will depend largely on the efforts and abilities of our senior management. In particular, we are dependent upon our President and Chief Executive Officer, Bayo O. Odunuga, and our General Counsel and Secretary, Patrick O. Okorodudu, who are responsible for developing our operations and business plans. The loss of services of senior management could have a substantial adverse effect on us. The expansion of our business will be largely contingent on our ability to attract and retain highly qualified corporate and operations level management team. There is no assurance that the Company can find suitable management personnel or will have financial resources to attract or retain such people if found. Our business will depend substantially on international prices for crude oil and refined products, and prices for these products are volatile. A sharp decrease in such prices could materially and adversely affect our business prospects and future results of operations. • Terrorism and global conflict. We anticipate that our revenues will come from sales of crude oil and natural gas. A significant and sustained decrease in crude oil prices could have a negative impact on our results of operations and financial condition. In addition, a reduction of international crude oil prices could result in a delay in our capital expenditure plan, in particular delaying exploration and development activities, thereby delaying the incorporation of reserves. The current global financial crisis and uncertain economic environment have led to lower oil prices that, if sustained, may negatively affect our future cash flow and make it difficult for us to achieve our growth objectives. The current global financial crisis and uncertain economic environment that worsened in the second half of 2008 have led to a worldwide decrease in demand for oil products. As a result, prices for oil products have fallen since the middle of 2008, from a high of approximately $137 per barrel (all countries spot price as estimated by the U.S. Energy Information Administration) to a low of approximately $34 per barrel at the beginning of 2009. Since the beginning of 2009 oil prices have recovered somewhat, currently averaging about $68 per barrel over the first three weeks of September 2009. If oil prices remain low, we may be required to revise our growth objectives, particularly in light of substantial decreases in the availability of credit in the capital markets. The global financial and economic situation may also have a negative impact on third parties with whom we do, or may do, business. Any of these factors may affect our results of operations, financial condition and liquidity. We do not own any of the crude oil and natural gas reserves in Nigeria. A guaranteed source of crude oil and natural gas reserves is essential to an oil and gas company's sustained production and generation of income. As mentioned above, under Nigerian law, the Nigerian government owns all crude oil and natural gas reserves in Nigeria and the concessionaire owns the oil and gas it produces. We possess the exclusive right to develop our reserves pursuant to concession agreements awarded to our local partners by the Nigerian government and we will own our percentage of the hydrocarbons we produce under the concession agreements, but if the Nigerian government were to restrict or prevent us from exploiting these crude oil and natural gas reserves, our ability to generate income would be adversely affected. Achieving our long-term growth prospects depends on our ability to execute our strategic plan, in particular discovering additional reserves and successfully developing them, and failure to do so could prevent us from achieving our long-term goals for growth in production. The ability to achieve our long-term growth objectives depends on discovering or acquiring new reserves as well as successfully developing them by completing long lead-time, capital-intensive projects timely and on budget. Our exploration activities expose us to the inherent risks of drilling, including the risk that we will not discover commercially productive crude oil or natural gas reserves. As described below, the costs associated with drilling wells are often uncertain, and numerous factors beyond our control may cause drilling operations to be curtailed, delayed or cancelled. If we are unable to conduct successful exploration and development activities, or if we do not acquire properties having proved reserves, our level of proved reserves will decline as reserves are extracted. Failure to secure additional reserves at acceptable costs may impede us from achieving our growth and production targets and may have a negative effect on our results of operations and financial condition. Our future drilling activities are capital intensive and may not be productive. • Shortages or delays in the availability or in the delivery of equipment. Certain of our future drilling activities may not be successful and, if unsuccessful, this failure could reduce the ratio at which we replace our reserves, which could have an adverse effect on our results of operations and financial condition. Competition from local and foreign crude oil companies may have a negative impact on our ability to gain access to additional crude oil and natural gas reserves in Nigeria and the surrounding region. NNPC and DPR under the Nigerian Ministry of Petroleum Resources are the key governmental entities responsible for promoting oil and gas investments in Nigeria, establishing reference terms for exploration rounds and assigning exploration blocks to oil and gas companies. Under current regulations, only the holder of a concession or assignee or other accredited contractors can engage in petroleum exploration and production operations in Nigeria. We will be competing with local and foreign oil companies for additional interests in blocks offered for exploration by the Nigerian government. Our ability to obtain access to potential production fields also will depend on our ability to evaluate and select potential hydrocarbon-producing fields and to adequately bid for these exploration fields. We will face similar competition from local market players and international oil companies in Ghana and other parts of the Gulf of Guinea. If we are unable to adequately compete with foreign and local oil companies, or if we cannot enter into joint ventures with market players with properties where we could potentially find additional reserves, we may be obligated to conduct exploration activities in less attractive blocks and our results of operations and financial condition may be adversely affected. In addition, many of our competitors are better capitalized than we are and have substantially greater marketing and technological resources, which could give them a significant competitive advantage. There is the possibility that our competitors could capture a significant share of our intended market with a materially adverse effect on our anticipated financial performance. We may experience difficulties in recruiting and retaining qualified personnel. The increase in worldwide activity in the oil and gas sector has resulted in an increase in the demand for qualified industry personnel. Compensation for oil engineers and other experienced industry personnel has risen in recent years making it harder for oil companies with smaller budgets to recruit and retain top talent. We will need to allocate resources to identifying and recruiting highly qualified personnel for our future drilling and other development activities. If we are unable to recruit the necessary personnel or if we cannot retain existing personnel, we may not be able to operate adequately or meet our growth plans which could adversely affect our results of operations. Our operations may be disrupted as a result of external factors. We will operate in both urban areas and remote and sometimes inhospitable regions. We are exposed to several risks that may disrupt our activities. These risks include, among others, adverse weather, fire disasters, explosions, malfunction of pipelines and emission of toxic substances. As a result of the occurrence of any of the above, our operational activities could be significantly affected or paralyzed. These risks could result in property damage, loss of revenue, cost of human lives, pollution and harm to the environment, among others. If any of these occur, we may be exposed to economic sanctions, fines or penalties. Management intends to purchase a corporate insurance program standard for our industry with specific coverage against property damage, sabotage and terrorism, general, product and environmental liability, loss of cargo and crime; however it is uncertain on what terms such insurance will be available to us. Due to the nature of our business, we are a highly vulnerable company, and could face losses due to risks excluded from or within deductibles of our corporate insurance program. Some other unexpected or unforeseen factors may affect our ability to continue our normal operations and materially affect our financial position. Our business will subject us to liability risks. We intend to produce, transport, refine and market materials with potential toxicity, and purchase, handle and dispose of other potentially toxic materials in the course of our business. Our operations will also produce byproducts, which may be considered pollutants. Any of these activities could result in liability, either as a result of an accidental, unlawful discharge or as a result of new conclusions on the effects of our operations on human health or the environment. Working with joint venture partners decreases our ability to manage risk. We will conduct many of our operations through joint ventures in which we share control with other parties such as local partners and local government. Differences in views among the joint venture participants may result in delayed decisions or in failures to agree on major issues. There is the risk that our partners may at any time have economic, business or legal interests or goals that are inconsistent with those of the project or us. There is also the risk our partners may be unable to meet their economic or other obligations and we may be required to fulfill those obligations alone. Our failure to adequately manage the risks associated with working with joint venture partners could have a material adverse effect on our financial condition or results of operations. We anticipate entering into additional joint ventures with other entities. There is no assurance that we will undertake such joint ventures or, if undertaken, that such joint ventures will be successful. Regulation of greenhouse gas emissions could increase our operational costs and reduce demand for our products. Management expects continued political attention to issues concerning climate change, and the role of human activity in it and potential remediation or mitigation through regulation that could materially affect our operations. Our financial performance will depend on a number of factors, including, among others, the greenhouse gas emissions reductions required by law, the price and availability of emission allowances and credits, the extent to which we would be entitled to receive emission allowances or need to purchase them in the open market or through auctions and the impact of legislation on our ability to recover the costs incurred through the pricing of our products. Material cost increases or incentives to conserve or use alternative energy sources could reduce demand for our products. To the extent these costs are not ultimately reflected in the price of our products, our operating results will be adversely affected. Compliance with Sarbanes-Oxley Act of 2002. We will be exposed to significant costs and risks associated with complying with increasingly stringent and complex regulations of corporate governance and disclosure standards imposed on public companies. Changing laws, regulations and standards relating to corporate governance and public disclosure, including the Sarbanes-Oxley Act of 2002, new SEC regulations and stock exchange rules require a growing expenditure of management time and external resources. In particular, Section 404 of the Sarbanes-Oxley Act of 2002 requires management’s annual review and evaluation of our internal controls, and attestations of the effectiveness of our internal controls by our independent registered public accounting firm. We do not have a recent trading history of common stock. The market price of our common stock may fluctuate significantly in response to a number of factors, some of which may be beyond our control. In the event that the trading price of our common stock declines, investors may lose all or part of their investment in our common stock. No dividends have been paid on our common stock. We do not anticipate the payment of cash dividends in the foreseeable future. If our operations become profitable, it is anticipated that, for the foreseeable future, any income received would be devoted to our future operations and that cash dividends would not be paid to our shareholders. We intend to seek equity financing to fund our future operations and growth. If we raise additional funds by issuing equity securities, stockholders may experience dilution of their ownership interest (both with respect to the percentage of total securities held, and with respect to the book value of their securities) and such securities may have rights senior to those of the holders of our common stock. Our common stock is concentrated in the hands of a few owners. Currently, our officers and directors and their related parties own the vast majority of the Company’s outstanding shares and are able to elect all of the directors and control the Company. Investors will likely own a minority percentage of our entire voting stock and have minority voting rights. Investors will not likely have the ability to control either a vote of our shareholders or Board of Directors. See Item 4, “Security Ownership of Certain Beneficial Owners and Management”. Currently, all of our potential oil assets are located in Nigeria. Under Nigerian law, the federal government owns all crude oil and natural gas reserves in Nigeria, and we have certain rights to explore and produce those reserves in areas awarded by the Nigerian government after public bidding. We will hold a 40% leasehold interest in and operatorship of the Nigerian offshore oil block OPL 2012, located in the Niger Delta. OPL 2012 has an indefinite lease term, and only terminates if after ten years no development is undertaken by the leaseholders on the oil block. OPL 2012 is situated within the central portion of the offshore Niger Delta in what is usually referred to as the “nose of the Delta”. This is an area associated with maximum deltaic progradation and sedimentation, usually evident in the maximum seaward growth of the delta within this region. The block is situated within the continental shelf, in water depths ranging from sixty meters to one hundred meters. OPL 2012 was carved out of what used to be OPL 225 (now OML 137) operated by Addax Petroleum. The block was recently awarded by the Nigerian Department of Petroleum Resources to a consortium led by Grasso Nigeria Limited. Previous drilling activities in the former block OPL 225 were concentrated in the southern part of the block. None of the wells drilled into the oil generating window. 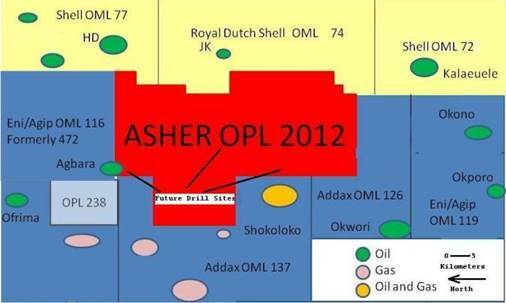 In April 2009, the Asher Shareholders commissioned an independent audit on OPL 2012. Bayphase Limited, a United Kingdom based oil and gas consultancy, performed the study. The purpose of the study was to categorize and evaluate the “Reserves, Contingent and Prospective” resources within OPL 2012 in accordance with the Petroleum Resources Management System (2007), proposed by the Society of Petroleum Engineers (SPE), American Association of Petroleum Geologists (AAPG), World Petroleum Council (WPC) and the Society of Petroleum Engineers (SPEE) as standardized definitions of petroleum resources and how they are estimated. The study was performed through a review of seismic data and interpretations and well data reports. From seismic data and interpretations, there are two major structures in OPL 2012. One structure in OPL 2012 contains an extension of the producing Agbara field (located in OML 116 and operated by Eni/Agip). This structure is an “exploitation” development and less risky to develop because of existing production and production facilities in the Agbara field. Accordingly, the resources associated with this structure have been classified by Bayphase Limited in its audit report as “reserves”. The second structure is located in the southeast of OPL 2012 (Shokoloko Discovery Extension in OML 137 operated by Addax Petroleum) and is an “exploration” development because there is no production or production facilities nearby, hence it is more risky to develop. This structure was accordingly categorized by Bayphase Limited as “contingent resources” since there is currently no viable commercial recovery of known accumulation under development in or around this structure. We believe that the presence of at least fifteen commercial oil fields in adjacent blocks indicates that the prospects of recovering oil from OPL 2012 are extremely high. However, we currently have no entitlement to any of these adjacent fields, and the locality of OPL 2012 does not assure that OPL 2012 will experience recoveries similar to its neighboring fields. Ÿ To the east: Addax Petroleum’s OML 126 (Okwori and Nda fields) has produced an estimated 265 million barrels of oil. Production commenced in March 2005 and averaged 41,250 barrels of oil per day (BOPD) in 2007. Further east is Eni/Agip’s OML 119 (Okono and Okpono fields) which has produced an estimated 240 million barrels of oil. Ÿ To the west: Eni/Agip’s OML 116 (Agbara field) is reported to have produced 100 to 120 million barrels of oil to date. Production commenced in 1989, and according to the production log with the Nigerian Department of Petroleum Resources, the average production from OML 116 in 2008 was 7,500 BOPD. Ÿ To the north and northeast: Shell’s OML 72 (Kalaeuele field), OML 74 (JK field) and OML 77 (HD field). There is currently no 3D seismic acquisition on OPL 2012. However, about 1400 kilometers of 2D seismic data exist in the block. These seismic data show good reflection quality down to five seconds of two way travel time, or down to depths of about 4,000 to 5,000 feet. Sedimentary packages typical of the paralic and marine paralic Agbada formation can be seen down to the equivalent depths. Although geologic structure alone is insufficient for hydrocarbon deposits, seismic structural review also shows the OPL 2012 block to be dissected by several synthetic and antithetic faults, some of which are associated with structural closures that could be potential prospects for hydrocarbon accumulations. A major structure building fault close to Addax Petroleum's OML 137 and OML 126 has been identified. It proceeds from Addax Petroleum’s OML 119 (formerly OPL 90), cuts into the southeastern portion of the OPL 2012 block, and proceeds through the block into Shell’s OML 74 (another producing block) in the northwest end of the OPL 2012 block. At December 31, 2013, there was no drilling in progress. We lease office space at 70 Mansell Court, Suite 100 Roswell GA 30076 and 10A Ajanaku Street off Salvation Road, Opebi-Ikeja, Lagos, Nigeria. Presently, there are no material pending legal proceedings to which we are a party, and no such proceedings are known to us to be threatened or contemplated against us. Our common stock is listed for quotation in the Electronic Bulletin Board owned and maintained by OTC, trading under the symbol "AXNO". The approximate number of record holders of our common stock as of the date of this Form 10-K is 2,656. Holders of our common stock are entitled to receive such dividends as may be declared by our Board of Directors. No dividends on our common stock have been paid to date nor do we anticipate that dividends will be paid in the foreseeable future. We currently have few capital resources and we are unlikely to generate significant revenues for some time. This raises substantial doubt about our ability to continue as a going concern. See Notes to our Financial Statements in Item 8, “Financial Statements and Supplementary Data”. Without realization of additional capital, it would be unlikely that we could continue as a going concern. However, management has been in discussions with several financial institutions (i.e. banks, private equity funds, sovereign funds, energy companies and other corporate entities) to procure funding for the development of OPL 2012 through the issuance of debt and/or equity. Based on these discussions management anticipates obtaining sufficient funding to perform our obligations related to OPL 2012 over the next year. Management is in the process of concluding financing arrangements with financial institutions in Nigeria who are finalizing their due diligence and economic modeling for the project. Management anticipates raising sufficient funds to pay the $12,500,000 signature bonus to the Nigerian government and the $10,000,000 farm-in fee to our local partner in the near future. Upon the payment of the signature bonus, the development of OPL 2012 will take place in two phases over a three year period. In Phase 1 (Year 1), we will pursue one of two scenarios. Scenario 1 involves working jointly with Eni/Agip to develop OPL 2012 through the unitization process, which enables owners of two straddled oil fields to proceed with the development and operation of the field as a single unit, to ensure maximum hydrocarbons recovery with no duplication of costs. Scenario 2 involves pursuing an international joint venture partnership with Superior Well Drilling LLC and its local Nigerian partner Omega Maritime & Energy Limited (collectively, “Superior”) to drill and complete one vertical well at 4,000 feet. Superior will provide rigs and drill the well, and Superior will be paid from proceeds of hydrocarbons recovered. Engineering and environmental work will be done prior to drilling and completing the vertical well. Such engineering and environmental work will include the casing and design of the well. In either Scenario 1 or 2, revenue sharing between Asher and Eni/Agip or Superior will be negotiated and agreed by the parties. Also, neither scenario includes provision for a 3D seismic program, as we now believe that, based on technical evaluation of OPL 2012, there is a chance that a 3D seismic survey may not need to be performed given there exists vintage 2D seismic data on OPL 2012. The project activities listed above are scheduled to run consecutively. Upon the payment of the signature bonus, we will submit our work program to the Nigerian government agencies responsible for oil exploration and production, Department of Petroleum Resources (DPR) and the Nigerian National Petroleum Corporation (NNPC), who will each have to review the work program and approve it before any exploration or production can commence. Once the government agencies approve the work program, management will decide on the appropriate scenario to pursue for Phase 1. Day 1, the official start date of the OPL 2012 development project, will occur as soon as management determines which scenario it will follow. opportunity to rectify or cure such fundamental non-performance issues if they are within our control. In case of further default, Sigmund Oilfield Limited would have the option to seek to terminate its agreements with us and potentially terminate our interest in OPL 2012. However, the OPL 2012 agreements were not drafted in such a manner that allows for immediate repercussions or sanctions imposed on us in the event we are unable to fund any of the development costs. Rather, the agreements provide for a dispute resolution process and contemplate discussion and negotiation among the parties in the event of our inability to perform. For example, although the $12,500,000 signature bonus and $10,000,000 farm-in fee were each deemed payable on May 15, 2009, we suffered no negative consequences from being delinquent in paying these amounts since it has regularly updated Sigmund Oilfield Limited on the status of when payments would be made and Sigmund Oilfield Limited has granted informal extensions of time for us to make such payments. Our expenses for the year ended December 31, 2009 were substantially higher than our expenses last year and consist mainly of legal professional and consulting costs associated with the filing of our registration statement and travel costs associated with doing business in Nigeria. The evaluation of our oil and gas reserves is critical to management of our operations and ultimately our economic success. Decisions such as whether development of a property should proceed and what technical methods are available for development are based on an evaluation of reserves. These oil and gas reserve quantities are also used as the basis of calculating the unit-of-production rates for depreciation, evaluating impairment and estimating the life of our producing oil and gas properties in our asset retirement obligations. Our proved reserves are classified as either proved developed or proved undeveloped. Proved developed reserves are those reserves which can be expected to be recovered through existing wells with existing equipment and operating methods. Proved undeveloped reserves include reserves expected to be recovered from new wells from undrilled proven reservoirs or from existing wells where a significant major expenditure is required for completion and production. We also report probable reserves and possible reserves, each of which reflects a lower degree of certainty of realization than proved reserves. When we have proved reserves, independent reserve engineers will prepare the estimates of our oil and gas reserves presented in our reports based on guidelines promulgated under GAAP and in accordance with the rules and regulations of the Securities and Exchange Commission. 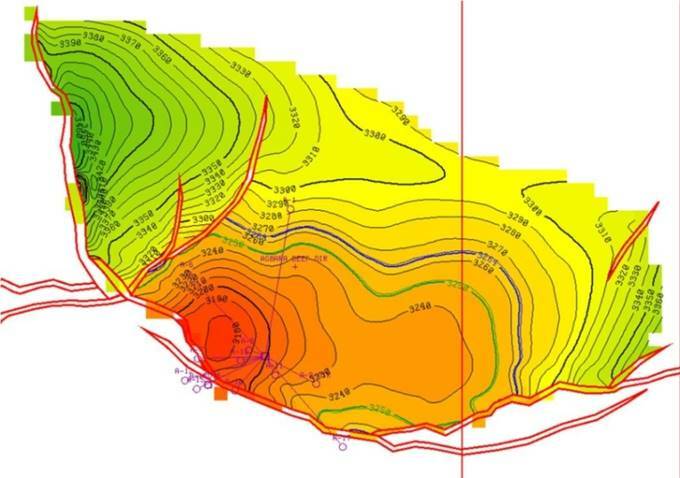 The evaluation of reserves by the independent reserve engineers involves their rigorous examination of our technical evaluation and extrapolations of well information such as flow rates and reservoir pressure declines as well as other technical information and measurements. Reservoir engineers interpret these data to determine the nature of the reservoir and ultimately the quantity of proved, probable and possible oil and gas reserves attributable to a specific property. Proved reserves include only quantities that we expect to recover commercially using current prices, costs, existing regulatory practices and technology. While we are reasonably certain that the proved reserves will be produced, the timing and ultimate recovery can be affected by a number of factors including completion of development projects, reservoir performance, regulatory approvals and changes in projections of long-term oil and gas prices. Revisions can include upward or downward changes in the previously estimated volumes of proved reserves for existing fields due to evaluation of (1) already available geologic, reservoir, or production data or (2) new geologic or reservoir data obtained from wells. Revisions can also include changes associated with significant changes in development strategy, oil and gas prices, or production equipment/facility capacity. The standardized measure of discounted future net cash flows relies on these estimates of oil and gas reserves using commodity prices and costs. Effective for the year ending December 31, 2009 and later, commodity prices are based on the average prices as measure on the first day of each of the last twelve calendar months. While we believe that future operating costs can be reasonably estimated, future prices are difficult to estimate since the market prices are influenced by events beyond our control. Future global economic and political events will most likely result in significant fluctuations in future oil and gas prices. Furniture, fixtures, equipment, and other are depreciated using the straight-line method over the estimated useful lives of the assets. The estimated life of these assets range from three to five years. assets, the fair value of impaired assets is determined based on the present values of expected future cash flows using discount rates commensurate with the risks involved in the asset group or based on a multiple of operating cash flow validated with historical market transactions of similar assets where possible. Long-lived assets committed by management for disposal within one year are accounted for at the lower of amortized cost or fair value, less cost to sell. The expected future cash flows used for impairment reviews and related fair value calculations are based on estimated future production volumes, prices and costs, considering all available evidence at the date of review. If the future production price risk has been hedged, the hedged price is used in the calculations for the period and quantities hedged. The impairment review includes cash flows from proved developed and undeveloped reserves, including any development expenditures necessary to achieve that production. Additionally, when probable reserves exist, an appropriate risk-adjusted amount of these reserves may be included in the impairment calculation. The price and cost outlook assumptions used in impairment reviews differ from the assumptions used in the Standardized Measure of Discounted Future Net Cash Flows Relating to Proved Oil and Gas Reserve Quantities. In that disclosure, SFAS No. 69, “Disclosures about Oil and Gas Producing Activities,” requires inclusion of only proved reserves and the use of prices and costs at the balance sheet date, with no projection for future changes in assumptions. Effective January 1, 2006, we adopted SFAS No. 123(R), “Share-Based Payment”. SFAS 123(R) replaced SFAS No. 123 and supersedes APB Opinion No. 25. SFAS 123(R) requires all share-based payments to employees, including grants of employee stock options, to be recognized in the financial statements based on their fair values. The pro forma disclosures previously permitted under SFAS 123 are no longer an alternative to financial statement recognition. We adopted SFAS 123(R) using the modified prospective method which requires the application of the accounting standard as of January 1, 2006. The consolidated and combined financial statements for the years ended December 31, 2009 and 2008 reflect the impact of adopting SFAS 123(R). Deferred income taxes are based on the difference between the financial reporting and tax basis of assets and liabilities. The deferred income tax provision represents the change during the reporting period in the deferred tax assets and deferred tax liabilities, net of the effect of acquisitions and dispositions. Deferred income tax assets include tax loss and credit carryforwards and are reduced by a valuation allowance if, based on available evidence, it is more likely than not that some portion of all of the deferred tax assets will be not be realized. Significant judgment is required in assessing the timing and amounts of deductible and taxable items. We establish reserves when, despite our belief that our tax return positions are fully supportable, we believe that certain positions may be challenged and potentially disallowed. When facts and circumstances change, we adjust these reserves through our provision for income taxes. To the extent interest and penalties may be assessed by taxing authorities on any underpayment of income tax, such amounts have been accrued and are classified as a component of income tax expense in our Statement of Operations. We adopted the provisions of Financial Accounting Standards Board (FASB) Interpretation No. 48, “Accounting for Uncertainty in Income Taxes, an Interpretation of FASB Statement No. 109,” (FIN 48) on January 1, 2007. The adoption did not result in a material adjustment to the Company’s tax liability for unrecognized income tax benefits. If applicable, we would recognize interest and penalties related to uncertain tax positions in interest expense. As of December 31, 2009, we had not accrued interest or penalties related to uncertain tax positions. The tax years 2006-2009 remain open to examination for federal income tax purposes and by the other major taxing jurisdictions to which we are subject. In May 2007, the FASB issued FSP No. FIN 48-1, Definition of Settlement in FASB Interpretation No. 48, (FIN 48-1) which amends FIN 48 and provides guidance concerning how an entity should determine whether a tax position is “effectively,” rather than the previously required “ultimately,” settled for the purpose of recognizing previously unrecognized tax benefits. In addition, FIN 48-1 provides guidance on determining whether a tax position has been effectively settled. The guidance in FIN 48-1 is effective upon the initial January 1, 2007 adoption of FIN 48. Companies that have not applied this guidance must retroactively apply the provisions of this FSP to the date of the initial adoption of FIN 48. We have adopted FIN 48-1 and no retroactive adjustments were necessary. As reflected in the accompanying financial statements, we had a working capital deficit and an accumulated deficit at December 31, 2011, which raise substantial doubt about our ability to continue as a going concern. Management plans to raise funds through the issuance of debt or the sale of common stock. The Financial Statements and Supplementary Data information required hereunder is included in this report as set forth in the "Index to Financial Statements”on page F-1. AsherXino Corporation (“AsherXino") is an exploration stage oil and gas company that holds an option to farm into a 40% leasehold interest in and operatorship of an offshore oil exploration and development block in Nigeria, Oil Prospecting License (OPL) 2012 (“OPL 2012”). AsherXino was incorporated in Colorado on June 9, 1981, under the name "Blue Grass Breeders, Inc." From 1981 through 2008, we were involved in multiple businesses: breeding and selling horses, manufacture and sale of computer hardware and software, and providing medical services. In 2008, after winding down prior operations, we became an inactive “shell” company. During the first quarter of 2009, we engaged in serious discussions with owners of certain oil and gas assets and preliminary discussions with various entities regarding potential debt and equity financing to support the exploitation of any assets to be acquired. These discussions ultimately led to our acquisition of our interest in the OPL 2012 effective June 30, 2009. Management has determined that the commencement of discussions in early 2009 represents our entry into the oil and gas industry as an exploration stage company. Accordingly, the accompanying consolidated financial statements set forth cumulative financial information for this new exploration stage, which we deem to have began on or about January 1, 2009. Our consolidated financial statements have been prepared in accordance with accounting principles generally accepted in the United States of America (“GAAP”). We consolidate all investments in which we have more than a 50% voting interest. The accompanying consolidated financial statements include the accounts of AsherXino and our wholly owned subsidiary, ASHERXINO Nigeria Limited, a Nigerian registered company. All significant intercompany accounts and transactions have been eliminated in consolidation. The preparation of financial statements and related disclosures in conformity with GAAP requires management to make estimates and judgments that affect the amounts reported in the consolidated financial statements and accompanying footnotes. These estimates are made based on management’s best knowledge of current events, historical experience, and various other assumptions that are believed to be reasonable under the circumstances. Actual results may differ materially from management’s estimates. Cash and cash equivalents are all highly liquid investments with an original maturity of three months or less at the time of purchase and are recorded at cost, which approximates fair value. Our securities investments are equity securities held principally for the purpose of selling them in the near term. Thus, they are classified as trading securities. Trading securities are recorded at fair value on the balance sheet in current assets, with gains or losses resulting from changes in fair value included in earnings. Fair value is determined using quoted prices in active markets for the identical asset; total fair value is the market price per share multiplied by the number of shares owned without consideration of transaction costs (level 1 inputs). As of December 31, 2011, we held no investments. Property and equipment are stated at cost, less accumulated depreciation. Depreciation is computed using the straight-line method over the estimated useful lives of the related assets. Equipment is depreciated over 3 years. We perform ongoing evaluations of the estimated useful lives of the property and equipment for depreciation purposes. Maintenance and repairs are expensed as incurred. We periodically review our long-lived assets for impairment whenever events or changes in circumstances indicate that the carrying amount of the assets may not be fully recoverable. We recognize an impairment loss when the sum of expected undiscounted future cash flows is less than the carrying amount of the asset. The amount of impairment is measured as the difference between the asset’s estimated fair value and its book value. During the years ended December 31, 2013, we had no impairment. We record the fair value of an asset retirement cost, and corresponding liability as part of the cost of the related long-lived asset and the cost is subsequently allocated to expense using a systematic and rational method. We record an asset retirement obligation to reflect our legal obligations related to future plugging and abandonment of our oil and natural gas wells and gas gathering systems. We estimate the expected cash flow associated with the obligation and discount the amount using a credit-adjusted, risk-free interest rate. At least annually, we reassess the obligation to determine whether a change in the estimated obligation is necessary. We evaluate whether there are indicators that suggest the estimated cash flows underlying the obligation have materially changed. Should those indicators suggest the estimated obligation may have materially changed on an interim basis (quarterly), we will accordingly update its assessment. Additional retirement obligations increase the liability associated with new oil and natural gas wells and gas gathering systems as these obligations are incurred. We account for income taxes using the asset and liability method. Under this method, deferred income tax assets and liabilities are determined based on differences between the financial reporting and tax basis of assets and liabilities and are measured using the enacted tax rates and laws that will be in effect when the differences are expected to reverse. We recognize the cost of employee services received in exchange for awards of equity instruments, such as stock or stock options, based on the fair value of those awards on the date of grant over the requisite service periods. Our basic earnings per share (EPS) amounts have been computed based on the weighted-average number of shares of common stock outstanding for the period. Diluted EPS reflects the potential dilution, using the treasury stock method, which could occur if options were exercised and restricted stock were fully vested. For loss periods, common share equivalents are excluded from the calculation, as their effect would be anti-dilutive. Ÿ Level 1 inputs consist of unadjusted quoted prices for identical instruments in active markets. Ÿ Level 2 inputs consist of quoted prices for similar instruments. Ÿ Level 3 valuations are derived from inputs which are significant and unobservable and have the lowest priority. As of December 31, 2013 and 2012, we had no financial instruments measured at fair value. However, during the quarter ended December 31, 2010, we determined that warrants we had issued during the period qualify as derivative financial instruments under the provisions of FASB ASC Topic No. 815-40, "Derivatives and Hedging - Contracts in an Entity's Own Stock." These warrant agreements include provisions designed to protect holders from a decline in the stock price ('down-round' provision) by reducing the exercise price in the event we issue equity shares at a price lower than the exercise price of the warrants. As a result of this down-round provision, the exercise price of these warrants could be modified based upon a variable that is not an input to the fair value of a 'fixed-for-fixed' option as defined under FASB ASC Topic No. 815-40 and consequently, these warrants must be treated as a liability and recorded at fair value at each reporting date with the change in fair value reflecting in earnings in other income within the caption "Gain (loss) on derivative warrant liability". The fair value of these warrants was determined using the Black-Sholes option pricing method with any change in fair value during the period recorded in earnings as "Other income (expense) - Gain (loss) on warrant derivative liability." Significant inputs used to calculate the fair value of the warrants at inception included stock price of $0.05; expected term of 0.17 years; cumulative volatility of 163%; zero dividends; and the risk-free interest rate of .18%. The warrants fall within level 3 of the fair value hierarchy. The warrants expired unexercised in December 2010. The change in fair value of the derivative liability represents the mark to market adjustment on the date the warrants expired. The carrying amounts reported in the balance sheet for cash and accounts payable and accrued expenses approximate their fair market value based on the short-term maturity of these instruments. In connection with the derivative liability, we recorded a loss of $20,250. In January 2010, the Financial Accounting Standards Board (FASB) issued Accounting Standards Update (ASU) No. 2010-06, Improving Disclosures about Fair Value Measurements (ASU 2010-06). This update provides amendments to Subtopic 820-10 and requires new disclosures for 1) significant transfers in and out of Level 1 and Level 2 and the reasons for such transfers and 2) activity in Level 3 fair value measurements to show separate information about purchases, sales, issuances and settlements. In addition, this update amends Subtopic 820-10 to clarify existing disclosures around the disaggregation level of fair value measurements and disclosures for the valuation techniques and inputs utilized (for Level 2 and Level 3 fair value measurements). The provisions in ASU 2010-06 are applicable to interim and annual reporting periods beginning subsequent to December 15, 2009, with the exception of Level 3 disclosures of purchases, sales, issuances and settlements, which will be required in reporting periods beginning after December 15, 2010. The adoption of ASU 2010-06 did not have a significant impact on our operating results, financial position or cash flows. In February 2010, FASB issued ASU No. 2010-09, Amendments to Certain Recognition and Disclosure Requirements (ASU 2010-09). This update amends Subtopic 855-10 and gives a definition to SEC filer, and requires SEC filers to assess for subsequent events through the issuance date of the financial statements. This amendment states that an SEC filer is not required to disclose the date through which subsequent events have been evaluated for a reporting period. ASU 2010-09 becomes effective upon issuance of the final update. We adopted the provisions of ASU 2010-09 for the period ended April 30, 2010. Other recently issued or adopted accounting pronouncements are not expected to have, or did not have, a material impact on our financial position or results from operations. As reflected in the accompanying financial statements, we had a working capital deficit of $290,213 and an accumulated deficit of $12,139,859 at December 31, 2012, which raise substantial doubt about our ability to continue as a going concern. Management plans to raise funds through the issuance of debt or the sale of common stock. We acquired a total of 310,000 shares of Hythiam common stock during 2005 through 2008 in connection with a financing arrangement entered into in 2002. Hythiam is a public company whose shares are quoted on the OTCBB. We acquired the shares of Hythiam common stock to sell in the near term to generate income. Management did not intend to hold the shares of Hythiam common stock for investment purposes, and accordingly, classified the shares as "trading securities" for all periods presented. Because of such classification, unrealized gains and losses were recorded in operations. As of December 31, 2009, we owned 44,600 shares of Hythiam common stock. During the year ended December 31, 2009, we sold the remaining 44,600 shares of Hythiam common stock for total proceeds of $15,436 for a realized loss of $1,958. Oil and gas asset consists of costs associated with the signing of OPL 2012 of $53,750 and $0 as of December 31, 2011. All oil and gas asset costs are excluded from amounts subject to amortization. The rights to OPL 2012 sign on by AsherXino are subject to our performance of the following obligations: (i) a signature bonus of $12,500,000 payable immediately to the Nigerian government and (ii) a $10,000,000 farm-in fee payable to a local partner. The status of the project is that we are seeking funding to fulfill these obligations and to conduct geological and geophysical work and a drilling program. We anticipate including the excluded costs into the amortization base during the next two (2) years. The following tables provide certain information about our excluded costs. From time to time, our officers and directors advance funds to us for working capital and receive repayments of such funds. As of December 31, 2012, the total amount due to related parties was $73,795 is unsecured, bears no interest and is due on demand. As of December 31, 2012, we had approximately $10,000,000 of U.S. federal and state net operating loss carry-forwards available to offset future taxable income, which begin expiring in 2026, if not utilized. The deductibility of losses incurred before June 19, 2009, the date we experienced a change in control, is limited by the provisions of section 382 of the Internal Revenue Code. Our deferred income taxes reflect the net tax effects of operating loss and tax credit carry forwards and temporary differences between carrying amounts of assets and liabilities for financial reporting purposes and the amounts used for income tax purposes. In assessing the realizability of deferred tax assets, management considers whether it is more likely than not that some portion or all of the deferred tax assets will not be realized. The ultimate realization of deferred tax assets is dependent upon the generation of future taxable income during the periods in which temporary differences representing net future deductible amounts become deductible. The deferred tax asset generated by the loss carry-forward has been fully reserved due to the uncertainty that the Company will be able to realize the benefit from it. The valuation allowance is evaluated at the end of each year, considering positive and negative evidence about whether the deferred tax asset will be realized. At that time, the allowance will either be increased or reduced; reduction could result in the complete elimination of the allowance if positive evidence indicates that the value of the deferred tax assets is no longer impaired and the allowance is no longer required. We have no positions for which it is reasonable that the total amounts of unrecognized tax benefits at December 31, 2012 will significantly increase or decrease within 12 months. ITEM 7. CHANGES IN AND DISAGREEMENTS WITH ACCOUNTANTS ON ACCOUNTING AND FINANCIAL DISCLOSURE. ITEM 7A. CONTROLS AND PROCEDURES. ITEM 7A(T). CONTROLS AND PROCEDURES. Under the supervision and with the participation of certain members of our management, including our Chief Executive Officer and interim Chief Financial Officer, we completed an evaluation of the effectiveness of the design and operation of our disclosure controls and procedures (as defined in Rules 13a-15(e) and 15d-15(e) to the Securities Exchange Act of 1934, as amended (the "Exchange Act"). In light of the material weaknesses discussed below, which have not been fully remediated as of the end of the period covered by this Quarterly Report, our Chief Executive Officer and interim Chief Financial Officer concluded, after the evaluation described above, that our disclosure controls were not effective. As a result of this conclusion, the financial statements for the period covered by this report were prepared with particular attention to the material weaknesses previously disclosed. Accordingly, management believes that the financial statements included in this Quarterly Report fairly present, in all material respects, our financial condition, results of operations and cash flows as of and for the periods presented. Our accounting staff is small and lacks experience with GAAP and SEC reporting requirements. We intend to implement a system of internal controls and remediate the deficiencies in our system of internal controls as we secure funding and grow. ITEM 8. DIRECTORS, EXECUTIVE OFFICERS, AND CORPORATE GOVERNANCE. As of the date of this Form 10-K, we had outstanding 161,582,542 shares of common stock and 0 shares of preferred stock. Our officers serve at the will of the Board of Directors. Presently we have no employment contracts with any of our officers. Brief biographies of our officers and directors are set forth below. Each director holds office until the next annual meeting or until his death, resignation, retirement, removal, disqualification or until a successor has been elected and qualified. Vacancies in the existing board are filled by a majority of the remaining directors. Bayo O. Odunuga became Chief Executive Officer of the Company and joined its Board of Directors upon our acquisition of the Asher Assets. Mr. Odunuga has more than nineteen years of experience as an energy advisor, management consultant and project manager with Price Waterhouse Coopers and EDS Corporation. He has extensive experience advising oil companies in field acquisition and development. He is a co-founder and former President and Chief Executive Officer of Rosegate Synergistic, Inc., a management consulting company, from July 2001 to December 2006. He was President of Apex Star Energy Corporation from January to August 2007. Since 2007, Mr. Odunuga, together with Patrick Okorodudu, has worked on the acquisition of the Asher Assets and related activities such as negotiating contracts with the Nigerian government and local Nigerian partners to obtain the rights to OPL 2012, performing due diligence on OPL 2012, commissioning an independent audit and arranging a 2D seismic study on OPL 2012. Patrick O. Okorodudu became our Secretary and General Counsel of and joined our Board of Directors upon ouracquisition of the Asher Assets. Mr. Okorodudu has over twenty years of experience as an attorney and consultant to local and international oil and gas companies in Africa and other international business entities. In 2001 he founded a company called Patina Group Inc., which specializes in executing oil and gas service contracts for West African exploration and production companies and provides legal and business development services for North American exploration and production companies seeking to do business in Western Africa. As President of Patina Group, Mr. Okorodudu's business tasks have included development of independent energy power and agro-allied sector development projects in emerging market economies. He has consulted with state governments in Nigeria on the establishment of city and rural gas-powered electricity projects; he has also assisted private refinery owners in the financing and construction of 60,000-100,000 bpd (barrels per day) capacity refineries. Patina Group has collaborated with local and international oil companies to form joint venture companies to embark on Directional Drilling projects, sub-sea development work, and oil and gas financing. Since 2007, Mr. Okorodudu, together with Bayo Odunuga, has worked on the acquisition of the Asher Assets and related activities such as negotiating contracts with the Nigerian government and local Nigerian partners to obtain the rights to OPL 2012, performing due diligence on OPL 2012, commissioning an independent audit and arranging a 2D seismic study on OPL 2012. Mr. Okorodudu is an associate member of the American Bar Association and the American Academy of Legal Studies in Business. He serves on the boards of several agro-allied and energy companies.Since 2003, Mr. Okorodudu has been teaching Business Law, Leadership and Ethics courses for several U.S. universities while taking time to complete doctoral studies in corporate governance law. Michael C. Hinton has been an officer and director of the Company since December 15, 1997, holding the office of Secretary from 1997 to 2003 and the office of President from 2003 until the present. Since 1990, he has been engaged in managing his own investments and is the sole owner of Multimarket Americas Export Corp. which is engaged in exporting telephone and construction equipment and the import of food products. Mr. Hinton received a bachelor's degree in economics from Colorado State University. After our Form 10 became effective, Mr. Hinton resigned from his positions as President of the Corporation and agreed to remain a board member.. We also intend to expand our Board of Directors to include Femi Dosunmu and Jimmy G. Delano, both of whom have agreed to join Asher’s Board of Directors. . Mr. Delano is a certified accountant with more than twenty-seven years of international business experience, a substantial portion of which was in Africa, while Mr Dosunmu is a seasoned Entrepreneur with over 25 years’ experience in Healthcare, Agriculture and oil and gas sector. He owns several businesses in USA, Nigeria and other West African Countries. Information Concerning the Board of Directors and its Committees. We do not have an Audit Committee, Compensation Committee, or Nomination Committee. We consider this appropriate for our size and stage of organization. We plan to create an Audit Committee and adopt a written charter after we add independent directors to the board. The Board has not adopted formal policies with regard to shareholder communications with individual Board members. However, we are currently in the process of developing these policies and procedures. The Board of Directors held meetings on 7 occasions during the year ended December 31, 2011. No incumbent director missed more than 90% of the meetings of the Board in the past year. We encourage members of the Board of Directors to attend our annual meetings. We did not conduct an annual meeting for the year ended December 31, 2011. We have reviewed the Forms 3, 4 and 5 submitted to us relating to 2011. No company's officers or filed all required Forms 3, 4 and 5 during 2011. We have not adopted a code of ethics that applies to the registrant's principal executive officer, principal financial officer, principal accounting officer or controller, or persons performing similar functions because we are in the organizational phase of our business. We are in the process of developing our code of ethics. None of the current officers or directors has received any compensation or remuneration from Asher for serving in these positions in the last two fiscal years of the Company. Future salaries of the officers and directors will be set by the Board of Directors depending upon our financial condition and market rates for small to medium sized energy companies, and may include bonuses, health insurance and other compensation as the Board of Directors may award. ITEM 10. SECURITY OWNERSHIP OF CERTAIN BENEFICIAL OWNERS AND MANAGEMENT AND RELATED STOCKHOLDER MATTERS. The following table contains certain information as of December 31 2013 as to the number of shares of common stock of the Company beneficially owned by each person who holds of record, or is known by management of the Company to own beneficially, more than 5% of the common stock outstanding, and by all directors and officers of the Company individually and as a group. Except as noted below, to the knowledge of management, each person named in the table has sole voting and investment power with respect to all shares of our common stock beneficially owned by such person. 1. Patrick Okorodudu, the Company’s Secretary and Director, is the Chief Executive Officer of Asher MHG Foundation. Bayo Odunuga, the Company’s Chief Executive Officer and Director, is a Director of Asher MHG Foundation. Messrs. Okorodudu and Odunuga disclaim beneficial ownership of shares held by Asher MHG Foundation. We know of no arrangement, including the pledge by any person of securities of the Company, which may at a subsequent date result in a change of control of Asher. There are currently no independent directors on the Board of Directors, although we anticipate that the Board of Directors will be expanded and two independent directors will join the Board of Directors following the effectiveness of our registration statement on Form 10, as described in Item 10, “Directors and Executive Officers”. Malone Bailey, LLP billed us in the aggregate amount of $15,000 for the year ended December 31, 2010, for professional services related to: their audit of our annual financial statements included in our Annual Report on Form 10-K and their reviews of our unaudited quarterly financial statements included in our Quarterly Reports on Form 10-Q. Malone Bailey, LLP fees for the year ended December 31, 2010 were $5,. Malone Bailey, LLP have not performed the annual audit for 2012, and accordingly did not bill us for, professional services rendered for tax related services for the years ended December 31, 2012. Our Board of Directors considers that the work done for us in the year ended December 31, 2010 by Malone Bailey, LLP is compatible with maintaining Malone Bailey, LLP’s independence. All of the work expended by Malone Bailey, LLP on our December 31, 2010 audit was attributed to work performed by Malone Bailey, LLP‘s full-time, permanent employees. Cordovano and Honeck LLP billed us in the aggregate amount of $69,580 for the year ended December 31, 2008, for professional services related to: their audit of our annual financial statements included in our registration statement on Form 10 and their reviews of our unaudited quarterly financial statements included in our registration statement on Form 10. Cordovano and Honeck LLP fees for the year ended December 31, 2008 were $72,000. Cordovano and Honeck LLP did not perform, and accordingly did not bill us for, professional services rendered for tax related services for the years ended December 31, 2009 and 2008. Cordovano and Honeck LLP did not perform, and accordingly did not bill us for, professional services rendered for any other services for the years ended December 31, 2009 and 2008. Our Board of Directors considers that the work done for us in the year ended December 31, 2008 by Cordovano and Honeck LLP is compatible with maintaining Cordovano and Honeck LLP’s independence. All of the work expended by Cordovano and Honeck LLP on our December 31, 2008 audit was attributed to work performed by Cordovano and Honeck LLP full-time, permanent employees. ITEM 13. EXHIBITS, FINANCIAL STATEMENT SCHEDULES. 31.1 Certification of Chief Executive Officer of AsherXino Corporation required by Rule 13a-14(1) or Rule 15d-14(a) of the Securities Exchange Act of 1934, as adopted pursuant to Section 302 of the Sarbanes-Oxley Act of 2002. 31.2 Certification of Chief Financial Officer of AsherXino Corporation required by Rule 13a-14(1) or Rule 15d-14(a) of the Securities Exchange Act of 1934, as adopted pursuant to Section 302 of the Sarbanes-Oxley Act of 2002. The financial statement schedules required by this item are set forth in the notes to our financial statements set forth on page 57 and F-1.